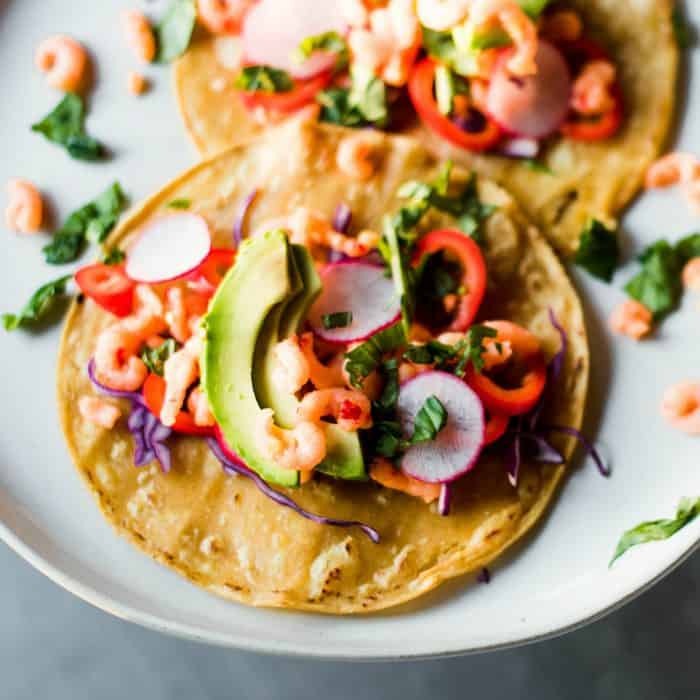 Fresh Sweet Chili Shrimp Tacos, a quick meal for last-minute company. Set out the toppings and enjoy a healthy lunch or dinner or “Taco Tuesday” night! One of our goals, when moving to a new house in a new town 2 years ago, was to use it as a resource for loving and feeding others. We wanted to make our house a cozy place where people felt comfortable coming by anytime, to just hang out or to enjoy a meal. 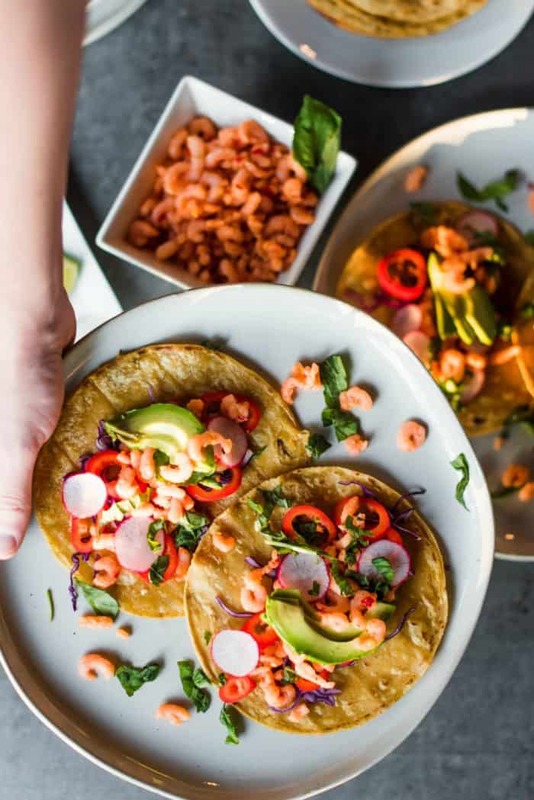 One way we decided to keep hospitality simple was to serve taco or tacos bowls, like this easy Sweet Chili Shrimp Tacos recipe. The consensus on tacos or bowls is that they’re so casual, everyone dishes up their own, so you can’t help but make guests feel at ease right away. 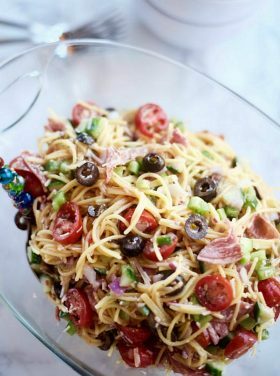 Grab a drink, grab a plate, and dish up! 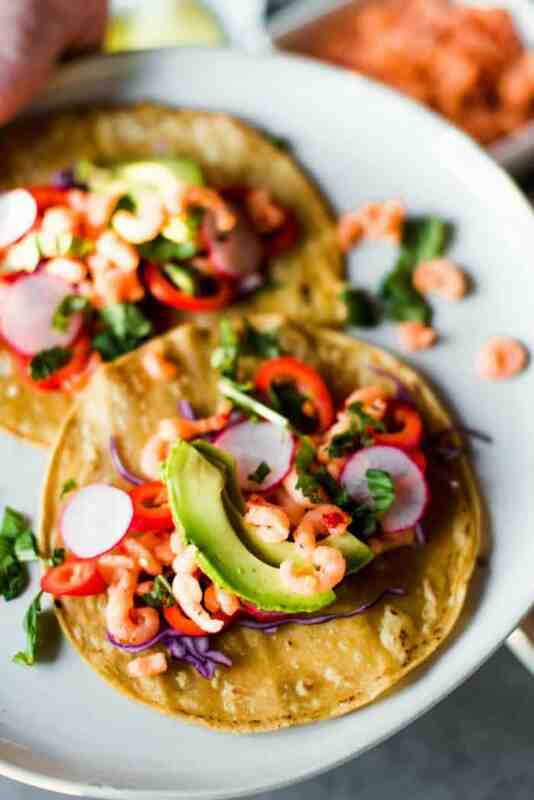 Oh, and you can also make with shrimp this Shrimp Ceviche Recipe With Mango and Avocado. Recently one of our friends brought a jug of sangria and and we made these tacos. How about these little galettes for dessert? 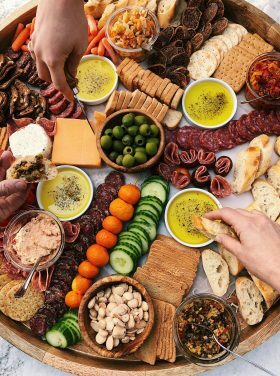 We would sit around the table and eat, and sip on drinks, and it was just the best thing ever. I love that our house became such a comfortable place for all our friends. 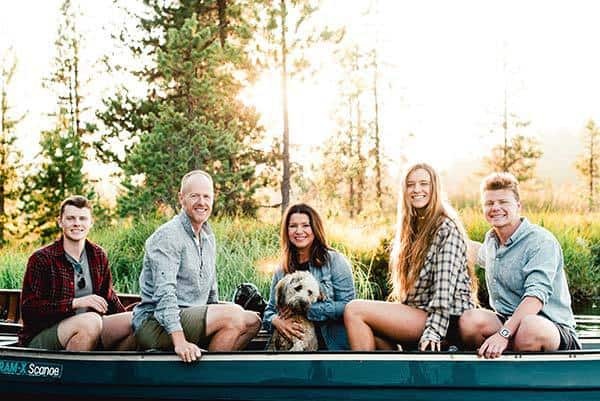 I think of our house as a “real” house … you know, a bit cluttery, not perfect in any way, but warm and cozy, with a great room and sitting area where everyone can mingle. 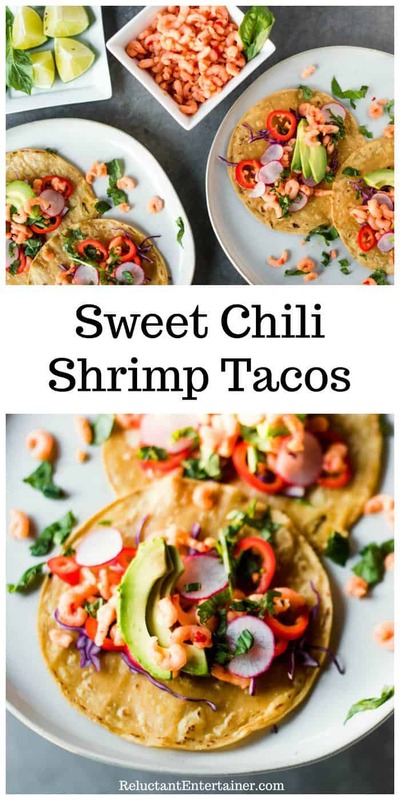 This Sweet Chili Shrimp Tacos recipe today is great, because you can make a lot, and leftovers are always good to have. 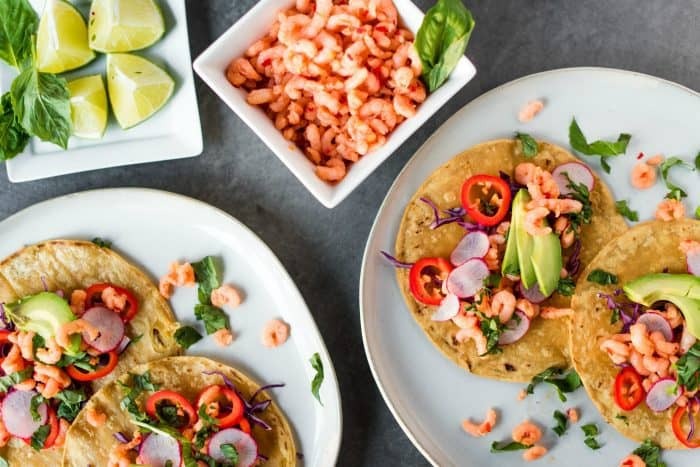 The tacos have a flavorful twist on typical tacos, and who doesn’t love baby shrimp? Set out fresh ingredients, like slaw, avocados, guacamole, tomatoes, and your favorite salsa. 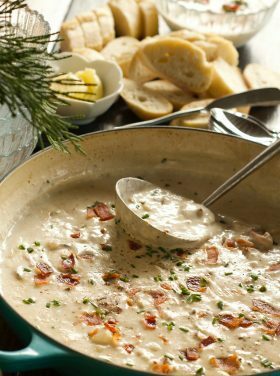 I also love this recipe because for last-minute guests, for example after-church friends, you can just stop off at the store and pick up a couple pounds of baby shrimp. Usually when you buy baby shrimp, it’s frozen. So bring it home and pop back into your freezer for when you’re ready to use. 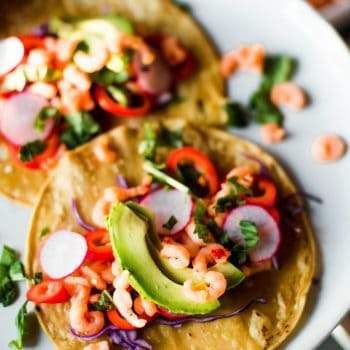 Or, buy it fresh at the counter, and come home and make these tacos. 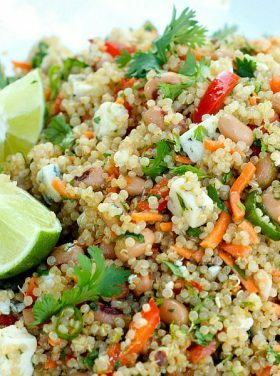 You may also enjoy Pineapple Baby Shrimp Farro Fried Rice or Classic Bay Shrimp Pasta Salad Recipe made with baby shrimp. 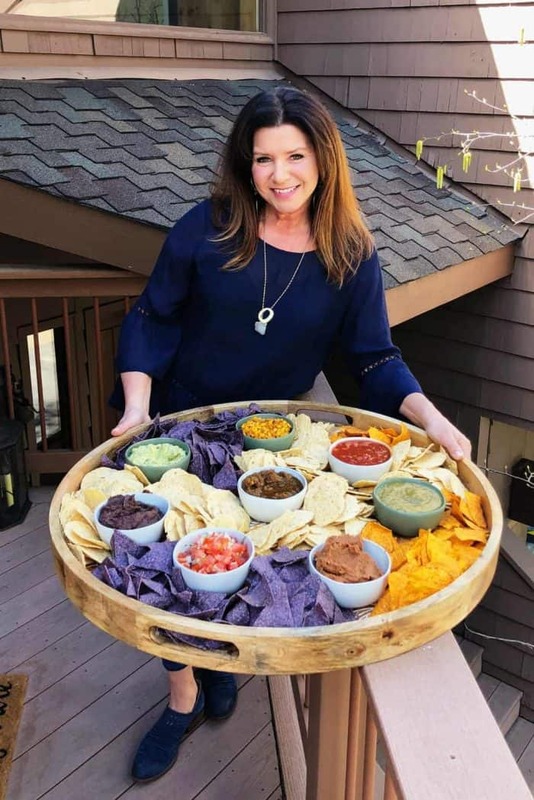 Now if a large group is coming, you can always serve your chips and salsa like this Epic Chips and Salsa Board! You can always have your friends bring the fixings (and sangria) for an inexpensive meal! Tacos don’t have to be served only on Taco Tuesday! 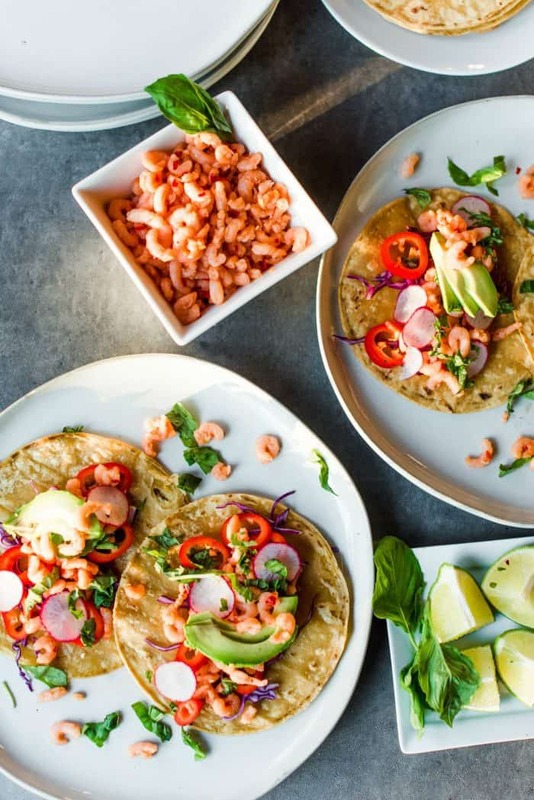 Gather your friends together and build relationships over a really, really simple meal like tacos, any day of the week. 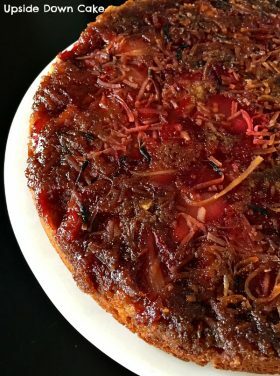 In a small bowl, combine chili paste, honey, lime, fish sauce, garlic powder, ginger, Worcestershire sauce, and salt and pepper to taste. Mix together thoroughly, then pour over shrimp and toss. 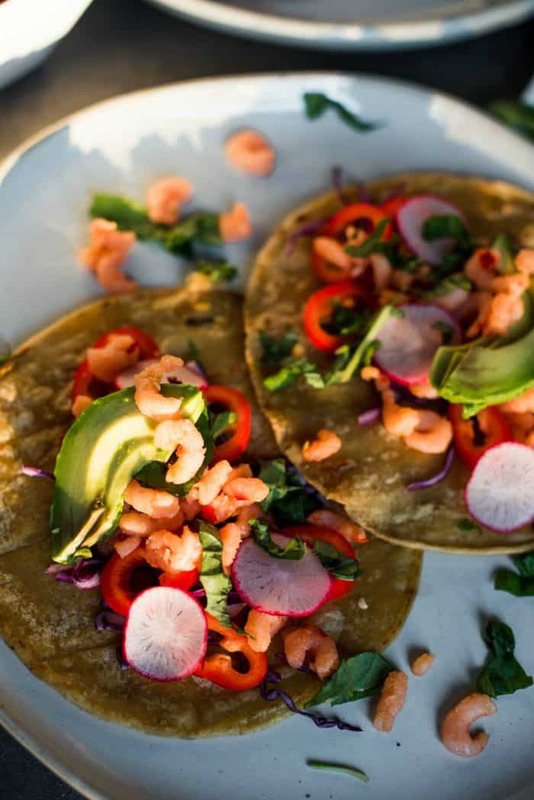 Refrigerate shrimp until tacos are ready to serve. 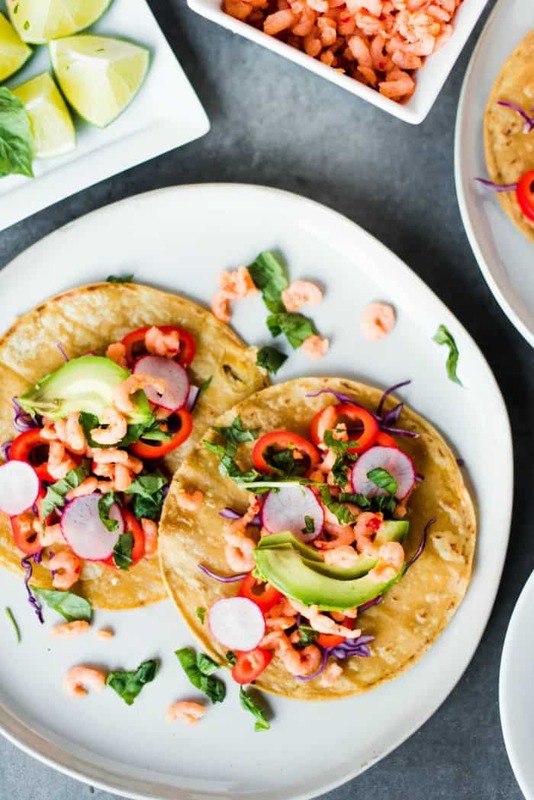 Serve shrimp mixture on tortillas with cabbage, radish, bell pepper, avocado, lime, and fresh basil. 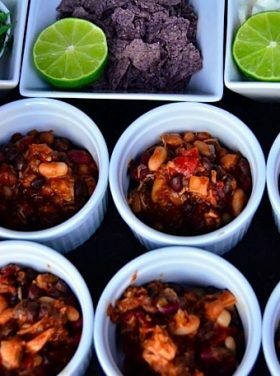 More taco recipes: Instant Pot Chicken Tacos [Spend with Pennies] and Crispy Cauliflower Tacos [Well Plated]. 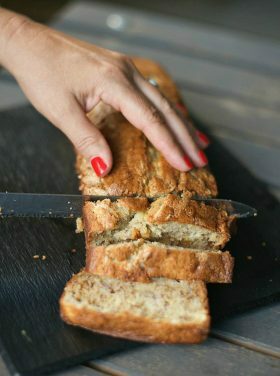 Casual Parties Entertaining Hospitality Main Dishes Parties Perfectionism Recipes Why Reluctant?